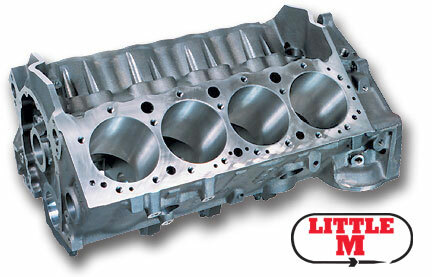 The Little M is cast from premium high strength iron and beefed up in all the critical areas. A competition oiling system ensures adequate lubrication to the main bearings at high rpm. You can select 4.000" or 4.125" cylinder bores, and 350 or 400 main bearings with steel 4 bolt main caps. Front and rear external oil feed, crossover and restrictor provision simplify plumbing with external pumps. With a standard deck height, extra thick siamese cylinder walls and a competition oiling system, the Little M is the perfect starting point for a powerful and reliable engine for the street or the race track. 4 bolt billet steel main caps have splayed outer bolts for extra strength. Front and rear external oil inlets, crossovers and restrictor provisions to simplify plumbing with external pump. Block includes special coated cam bearings, freeze plugs and dowels. Avaialable in 350 or 400 mains, 4.00 or 4.125 bore.